ICAS returns to the top floor of the Leadenhall Building on 21 June for the 2018 Young CAs Summit, held in association with Investec Click & Invest. Join innovators, entrepreneurs and inspiring experts in modern business skills to talk, laugh and boost your career. This year, the focus is on you. 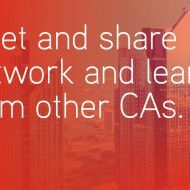 Offering an expert perspective on essential career-building tools and presenting CA success stories to inspire your ambitions, the Young CAs Summit is the must-attend event of the year for any professional aiming to reach new heights. 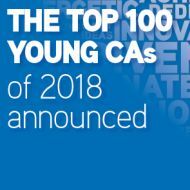 In the surroundings of the iconic 'Cheesegrater', ICAS will be celebrating the achievements of our Young CAs, not least with the presentation of the 2018 One Young CA Award, recognising an exemplary member of the community. As well as stunning views and sparkling conversation, the Summit will feature two lightning sessions focused on CA entrepreneurs and innovators, ready to share their experiences and advice in successfully navigating a changing economic landscape. Bruce Walker, Co-Founder of FutureX and Founder of WeAreTheFuture, has dedicated his young career to forming connections for change all around the world. At just 23, he believes businesses can be a force for good and supports entrepreneurs across the world to create profit with purpose. Listen to his story at the Young CAs Summit and find out how he has influenced some of the world's biggest brands, from Google to Mastercard, on forming partnerships to benefit the world. Elsewhere on the day, US-based Paul Thomson CA will join Angela Malik CA, Kimberley Oliver CA and Joel Watt CA for an inspirational and educational session on entrepreneurship. "I'm looking forward to being back in the UK amongst British humour at the Summit. Americans really don't get Scottish banter." Answering your questions, the group will share the ups and downs of starting a new business and fueling its growth to success. Ricky Munday CA, Tom Parkinson CA and Sumati Sharma CA will also be presenting at the Young CAs Summit, examining innovations in the business and finance sphere and explaining how you can adapt your thinking to make the most of new ideas. I’m looking forward to hearing what is important to our Young CAs as they undertake their own professional journeys - what motivates and drives them to be their very best? I qualified in 2001 at EY Edinburgh so I’m sure times have changed... or maybe not? Industry expert Tom Kerr will lead attendees through a Networking Masterclass, letting CAs in on the secrets of making a great impression and walking away with a valuable contact. This interactive session will encourage you to step outside your comfort zone and dazzle your professional peers to craft your network into a well-oiled machine. David Levin, the UK's foremost professional tweeter and Creative Director of social agency That Lot, will be presenting the best way to get the most out of your online presence. How does your Twitter follower count influence your career? What potential lies with your Facebook friends and LinkedIn connections? Find out and learn how to engage your audience with this Social Media Masterclass. Tickets are still available for the 2018 Young CAs Summit. ICAS members attend for free so register your interest now.